I used to love, love, love Easter as a child growing up in Sweden, and it’s quite funny how since I moved to England I kind of just forgot about it all. It’s probably because in Sweden Easter is celebrated as a secular holiday and never held any religious connotations for me as a child, I just loved the big family parties, dressing up as an Easter witch…. and of course the massive Easter eggs my parents used to prepare filled with sweets! And as a grown up, all that sugar and dressing up never really appealed and we didn’t celebrate Easter much. I’m still not a religious person, but I look back at the Easter celebrations of my childhood with very fond memories. And of course, I want to pass on some of all that fun to my son who’s growing up here in England. When I set out to write a bilingual Easter book there were three things I wanted to be sure to include. Firstly - the magic of the Easter eggs. Filled to the brim with chocolate and sweets. Oh yes, Easter should be celebrated in a sugar rush! Kids in Sweden get Easter eggs filled with sweets either on Maundy Thursday or Easter Eve. They’re sometimes hidden in the garden, although my parents just used to give them to us kids. These days there might be some talk about the Easter bunny, but he’s a fairly new addition to the Swedish Easter. Second, I wanted to include the Easter twigs, also known as the Swedish Easter tree. I used to love decorating the twigs we cut from our nearby forest and I want our little boy to experience that too. Swedes decorate Easter twigs with beautiful feathers and painted blown-out eggs, and usually willow or birch twigs are used. 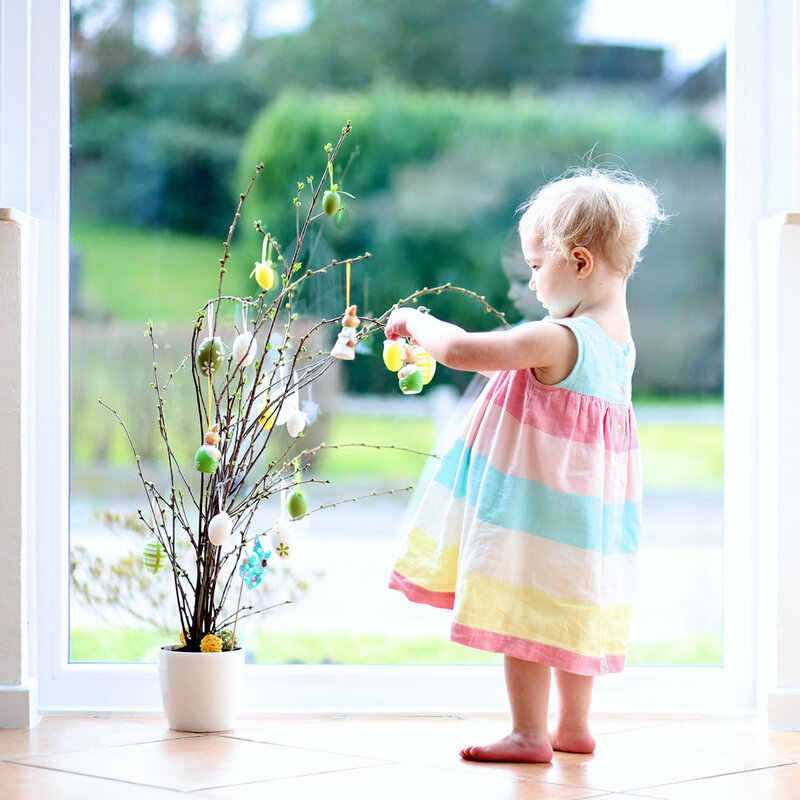 But of course, you could just as well decorate a bush or a tree with feathers for Easter if you want. Then finally, the joy of looking through my mum’s wardrobe for long skirts, and big blouses that we rolled up and stuffed with cushions to fit us kids. And, best of all - putting on sticky makeup to create the red cheeks and freckles that all Easter witches must have. Then, to top it all off we’d wear head scarves and aprons - looking like little old ladies on their way to market we’d walk round the neighborhood begging for sweets. We’d have chocolate and sweets to last us for months! In the old days, people believed that the witches flew on broomsticks to Blåkulla to have fun at Easter. In some parts of the country, Swedes still light a bonfire in the evening of Easter Eve to keep the witches away. Hoppe the hare is the hero of my Easter story and he’s taken it upon himself to organise an Easter party for the other animals in the forest. I hope this will be a useful book for enjoying not only a fun story but also to learn about the Swedish Easter. You can check out the Easter book here.